One of my professional credentials is that I am a Six Sigma Master Black Belt. (This means I know about quality management, not that I am a martial artist.) One of the truisms of quality management is that if you mess up for a customer, making it right can strengthen your relationship with that customer. I experienced this myself last week, during the Grace Hopper Celebration of Women in Computing with my order from OvernightPrints. I have been in too many panels or presentations when someone refers to a helpful resource and very few of the audience successfully record that information. At best, this results in plaintive repeated audience requests for the speaker to give the reference information again (“What was that title you mentioned?” “Please repeat that phone number.” “You said h-t-t-p-:-/-/-w-w-w and then what came next?”). At worst, everyone just misses out. 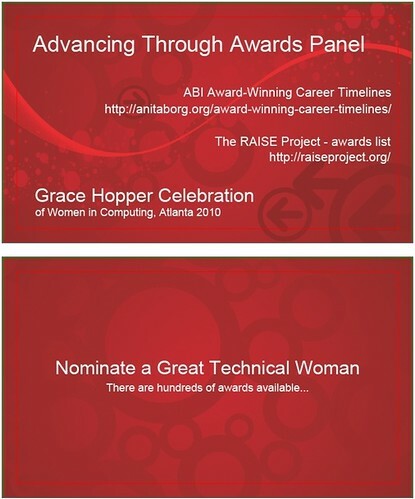 For my Hopper Conference panel “Advancing Your Career Through Awards”, I wanted to do better. I ordered regular business cards printed with our panel’s key reference information. The cards were supposed to arrive the day before the panel so there would be time to distribute in advance. I paid a great deal extra to be sure of timely arrival. The promised day came and went with no cards, despite repeated and increasingly urgent phone calls by me to OvernightPrints. The cards did finally arrive, less than an hour before my panel started. This was unneeded aggravation and caused me to spend time on the phone rather than fully participating in several Hopper Conference events. The cards were a hit but we distributed only half of the number I had printed because of delayed arrival. When I returned home from Atlanta, Georgia, I called OvernightPrints. They apologized, which was not good enough. After discussion, they ended up refunding the shipping charges, accepting back and giving me a refund for the cards we could not distribute (they paid for the unused cards to be shipped back), and giving me a discount against future orders. OvernightPrints made it right and kept my business.